1. Centaurea cineraria is an evergreen and cold hardy plant for outdoor gardens. 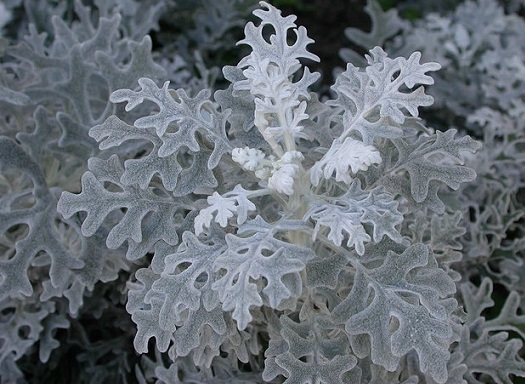 Commonly described as Dusty Miller, the plan grows up to 1 foot and produces beautiful silvery foliage. Inconspicuous flowers of white or yellow colors appear in summer. Centaurea cineraria prefers full sun but can be grown under light shade. The plant is usually used in borders and flower beds as filler plant. Propagation is done from seeds or cuttings. 2. Cordyline ssp. : Cordyline is a genus of beautiful foliage plants grown widely in beds, containers or in coastal as well as urban landscapes. Young plants can be used in bedding or as ornamental container displays. Most species would grow as woody, cold hardy, and evergreen shrubs producing attractive foliage of green, bronze or purple colors. 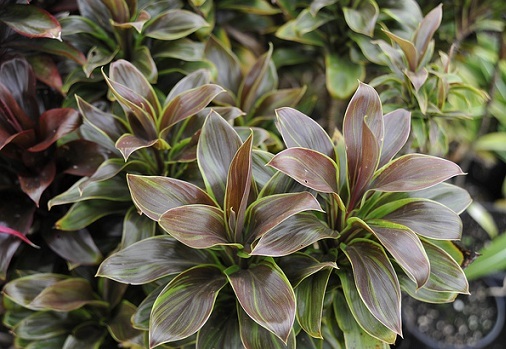 Though cold and frost hardy, Cordylines prefer sunny spot or lightly sheltered positions in a well-drained soil. Propagation is done from divisions. 3. 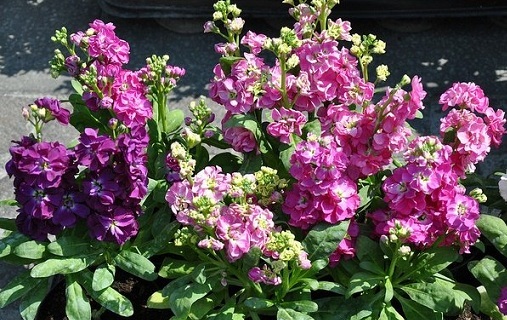 Matthiola incana is one of the most popular annuals grown in almost all parts of the world. The plant is known for its tall stocks of colorful and fragrant flowers. In cold climates, Matthiola incana is sown in summer for flowering in the following spring (when temperature is under 75º F). Commonly known as Stock, Matthiola incana grows easily from seeds and is used in flower beds for profuse flowering. The plant required sunny exposure and well-drained soil. 4. 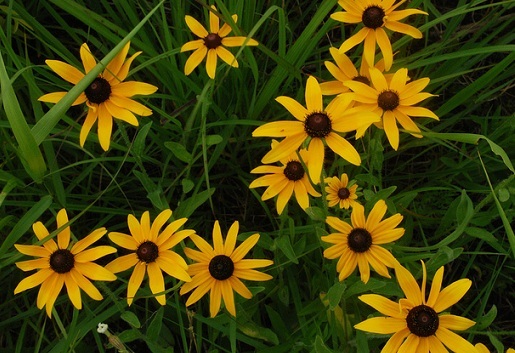 Rudbeckia hirta is a profuse bloomer with daisy like flowers that comes in all shades of yellow, orange and red. The plant usually grows up to 1 meter; flowers appear from mid-summer to early fall. These cold and frost hardy plants are suitable for flower beds, containers, and mixed borders. Rudbeckia hirta prefers a regular but well-drained soil mix under in full sun or partial shade in moderate and cold climates. Seeds can be sown in spring. 5. Lavatera trimestris is commonly known as Rose Mallow. It grows as a bushy plant in produces cup-shaped flowers from summer to fall in cold climates. Originally belonging to the Mediterranean region, Lavatera trimestris can easily tolerate cold and frost. The plant prefers lightly sandy and loamy but well-drained soil mix. In cold climates, it prefers dry or lightly moist soil. 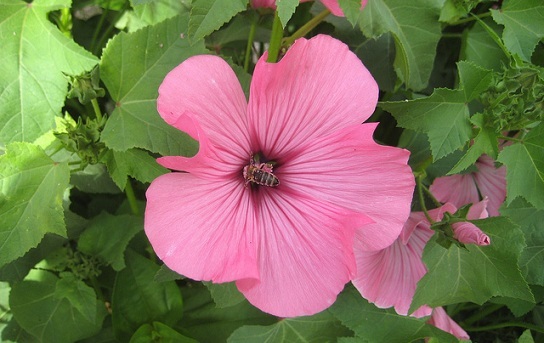 Lavatera trimestris makes a good choice in mixed borders, flower beds or as patio/container plants. In cold climates, seeds are sown in spring for a prolific flowering period from June to September.